Shiver me timbers, mateys! We have a winner! Ahoy there, mateys! It's International Talk Like A Pirate Day! How do you plan to celebrate? I'm going to kick off the festivities by announcing the winner of the autographed copy of Pirate's Lullaby: Mutiny at Bedtime. But before I announce the winner, I'd like to you to meet the crew one last time. Aren't they fabulous?! Thank you so much to everyone who sent in pictures! I appreciate your enthusiasm and support. The winner of the autographed copy is Keila Dawson! Congratulations, matey! Look for an email from me. I hear it's faster than a message in a bottle! Now get out there an celebrate like a pirate! Arrr! Ahoy mateys! The Pirate of the Day Contest is now closed but I wanted to share with you all of the wonderful entries I received. Aren't they a fine looking crew?! Thank you for helping me celebrate! One lucky winner will receive an autographed copy of Pirate's Lullaby: Mutiny at Bedtime. Winner will be chosen this Saturday, September 19th, International Talk Like A Pirate Day. Arrrr ye ready? Scarlett is Pirate of the Day! Yo, ho, ho, mateys! 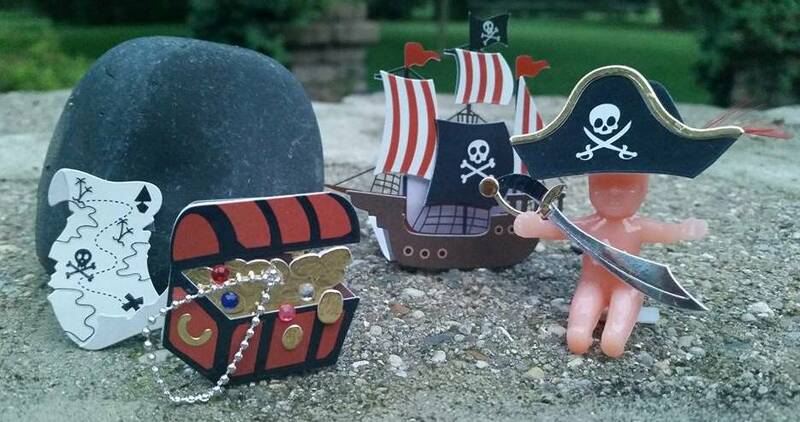 Check out the latest entry in the Pirate of the Day contest. This is me mate, Scarlett, dressed as Captain Hook, from J.M. Barrie's Peter Pan! I'm sure this budding thespian had a swashbuckling good time playing the old captain on stage. Maybe we'll see her on the big screen one day! Thank you for sending in the picture, Beth. Scarlett has been entered into the contest to win an autographed copy of Pirate's Lullaby: Mutiny at Bedtime. Be a pirate! Snap a pic! Send it in and you could be Pirate of the Day! The Wilsons are Pirates of the Day! I've got a whole crew of pirates on the blog today! The Wilsons are Pirates of the Day! Next up is his big sister. I like her shirt, too. In addition to being a pirate lover, I know she's also an accomplished figure skater. I guess that means she's a water lovin' gal no matter the water's state. Last up are their parents, two of my oldest friends, part of my college "crew". Blimey! 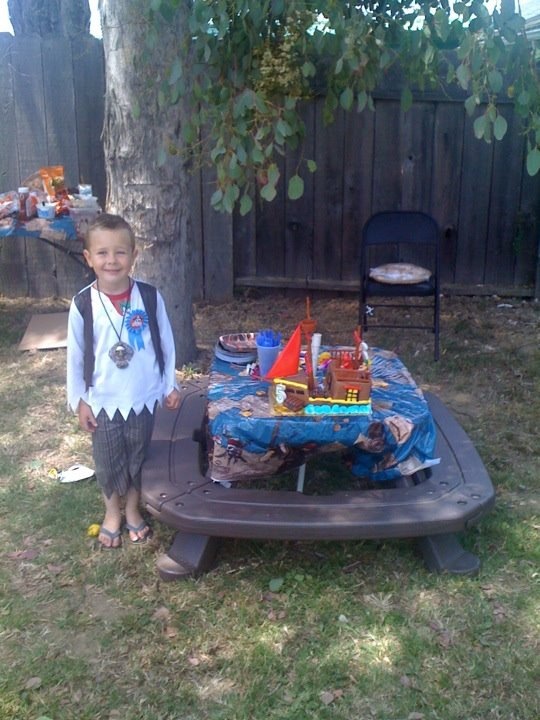 It looks like they threw a first class pirate party for the littlest mutineer. Did you see the treasure chest cake? Adorable. The Wilsons are Pirates of the Day and have been entered into a contest to win an autographed copy of Pirate's Lullaby: Mutiny at Bedtime. Throw caution to the wind and enter the Pirate of the Day Contest. Eli is Pirate of the Day! Today's Pirate of the Day is Eli. Eli really isn't a "salty dog" as he's never been to sea. 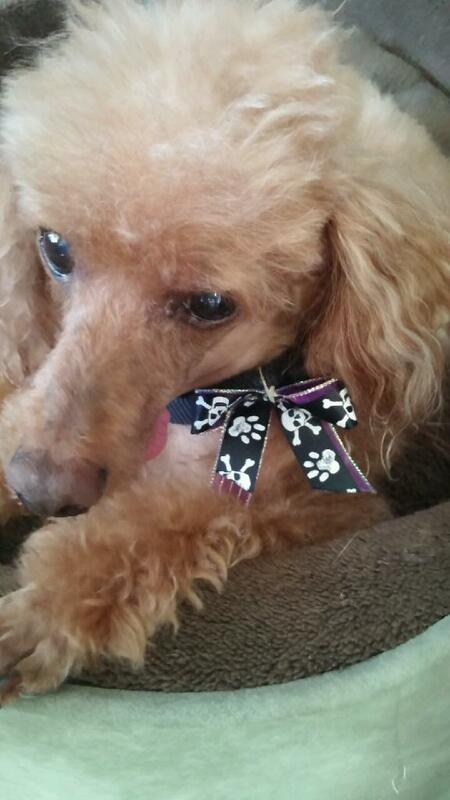 But withthat spiffy pirate ribbon, you can definitely call him cute! Would you, your child or your pet like to be Pirate of the Day? Be brave! Be bold! Be a pirate! Enter the Pirate of the Day contest and you might win an autographed copy of Pirate's Lullaby: Mutiny at Bedtime! Yo, ho, ho! It's launch day and Nina is Pirate of the Day! Yo, ho, ho! It's launch day! And as Pirate's Lullaby: Mutiny at Bedtime makes its way out into the world, we need to celebrate. What better way to that than with two lovely pictures of our Pirate of the Day, Nina. I just love Nina's beautiful smile. But wait? Does Nina have a mischievous side as well? Of course! She's a pirate! She charming and a little bit dangerous. Check out her fierce stance. Thank you Nina for being Pirate of the Day! You have been entered into the contest to win an autographed copy of Pirate's Lullaby: Mutiny at Bedtime. Would you like to be Pirate of the Day? Be brave! Be bold! Bea a pirate! Throw caution to the wind and enter the Pirate of the Day contest. The Rinka kids are Pirate of the Day! Pirates must run in the family! 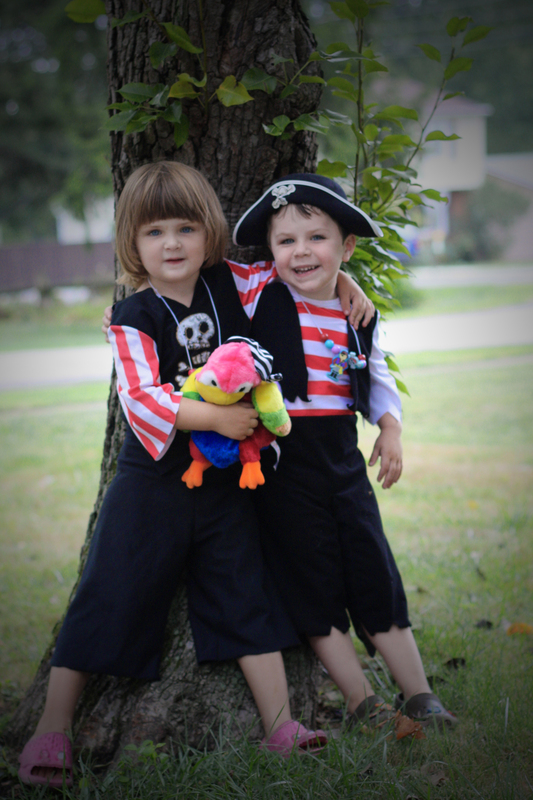 Today, our Pirates of the Day are my niece and nephews. They are all grown up now, but weren't they cute little mutineers? They were big fans of the Patch the Pirate radio show thus the matching outfits. Thanks to my sister in law for sending in this old family picture to help us celebrate the publication of Pirate's Lullaby. Would you like to be pirate of the day? Enter the Pirate of the Day contest and you could win an autographed copy of Pirate's Lullaby. King Cake Baby is Pirate of the Day! Shiver me timbers, y'all! The King Cake Baby is Pirate of the Day! Wait?! What's a king cake? And why is there a baby inside? Everyone knows they celebrate Mardi Gras in New Orleans. Mardi Gras or Carnival season officially begins on January 6th or "King's Day" - also known to Christians as the Epiphany. Epiphany comes from a Greek word that means "to show". Bethlehem is where infant Jesus first showed himself to the world. As a symbol of this holy day, a tiny plastic baby is placed inside each King Cake. The King Cake tradition is thought to have been brought to New Orleans from France in 1870. A King Cake is an oval-shaped bakery delicacy - a cross between a coffee cake and a french pastry that is rich in history as it is in flavor! It is decorated in royal colors or Purple which signifies "Justice", Green for "Faith", and Gold for "Power". These colors were chosen to represent a jeweled crown honoring the wise men (the Three Kings) who brought gifts to the Christ Child on the Feast of Epiphany. In the past, such things as coins, beans, pecans, or peas were hidden inside each King Cake. Today, a tiny plastic baby is the common prize. At a party, the King Cake is sliced and served. Each person looks to see if their piece contains the baby. If so, then that person is named "King for a day" and bound by custom to host the next party and provide the next King Cake! The King Cake Baby is also a character in my friend, Keila Dawson's, adorable picture book, The King Cake Baby, a tasty New Orleans style retelling of the Gingerbread Man. I can't believe King Cake Baby has all of the important pirate accessories - a ship, a map, a treasure chest, a hat & sword! So cute! And with all of this talk of cake, I'm hungry! Maybe we should have a king cake to celebrate Pirate of the Day! Here is a picture of the one my wee mutineer & I made two years ago for Mardi Gras. Laissez les bons temps rouler! 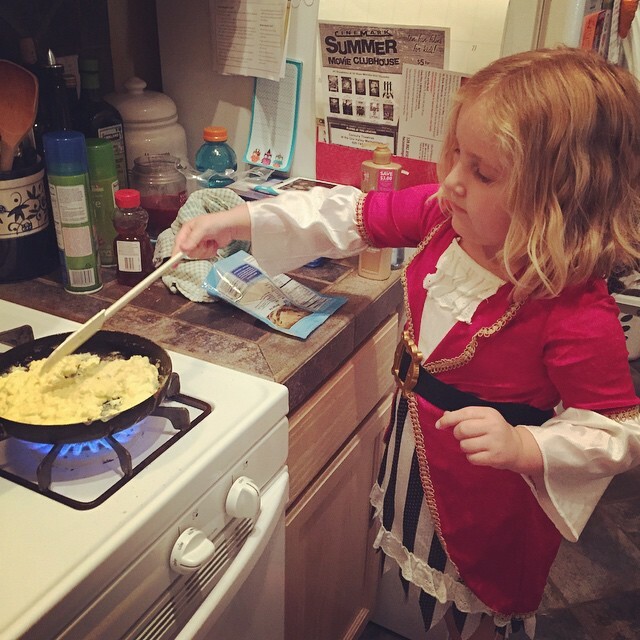 Thanks for your adorable & tasty entry, Keila! Would you like to win an autographed copy of Pirate's Lullaby? Enter the Pirate of the Day contest! 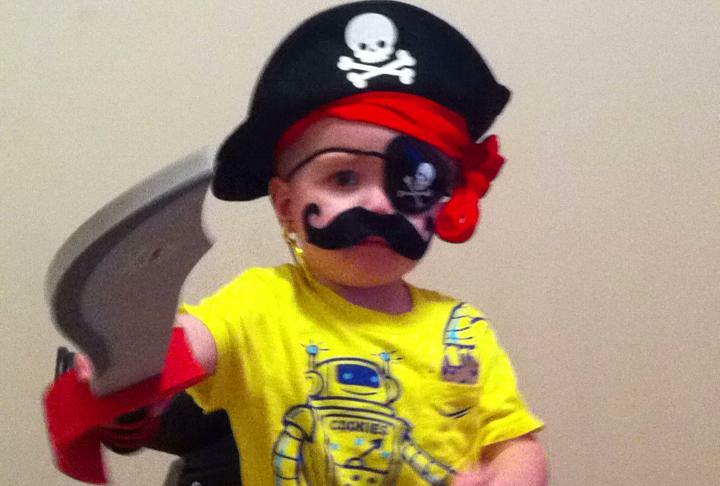 Nan's grandsons are making a special return appearance in the Pirate of the Day contest! Look at this wee mutineer's outfit! I love his robot t-shirt. And the giant mustache? Too cute! Do you think he's going to make someone walk the plank with that sword? Aye, aye! Is that a Jack and the Never-land Pirate costume? My wee mutineers really liked that show, too! Yo, ho! Let's go! Here's one last picture. 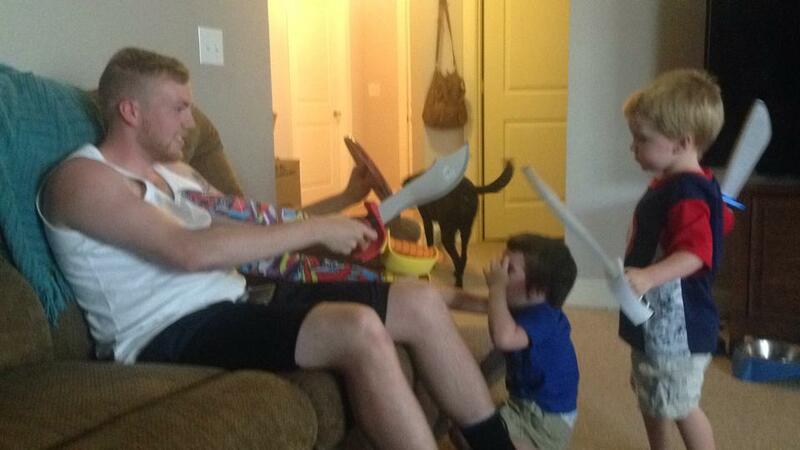 Nan's grandkids pillaging and plundering for Halloween treats! 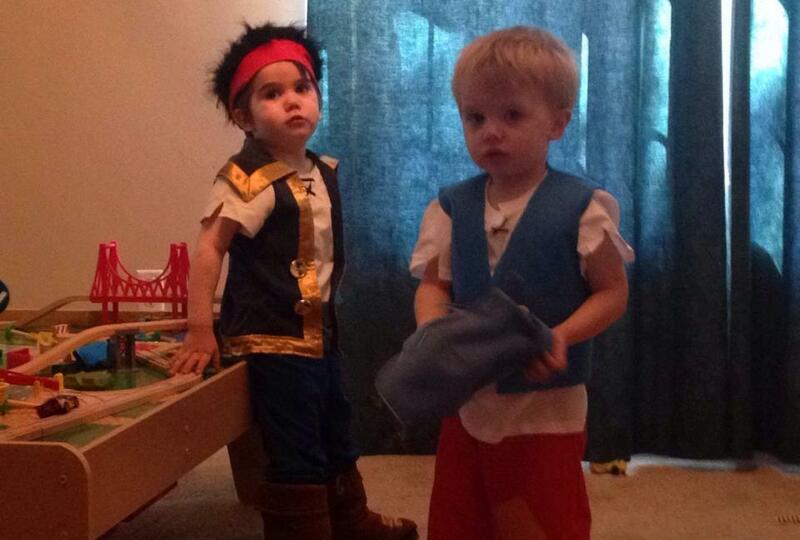 I bet they scored a whole treasure chest full of candy! So cute. Thanks for sharing, Nan! Join the pirate crew & you could win a copy of Pirate's Lullaby: Mutiny at Bedtime. Find out more about the Pirate of the Day contest, here.